See this guide for KEYENCE's lineup of new contact sensors supporting a wide variety of communication interfaces. With this PLC, you can collect data related to equipment operation such as temperature, pressure, production volume, and losses without having to use a PC. 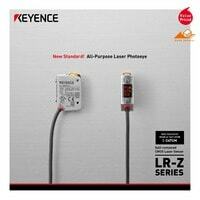 The LR-Z Series go beyond the stereotypes of reflective sensors. It is a suitable selection for ALL detections. Uneven, dark, metal, shiny or even rough surfaces can be detected stably from a detecting distance of over 500mm.